The truth is out there. Sometimes it's so out there that it happens in Bridgeville. Things get spacey this Saturday, Aug. 15 from 10 a.m. to 5 p.m., as BridgeFest, the town's annual flying floppy festival welcomes you and 50 (or more) shades of grays to the wackiest party this side of Solaris. Does anybody own this town? 'Cause the good folks who live there pretty much do what they want. 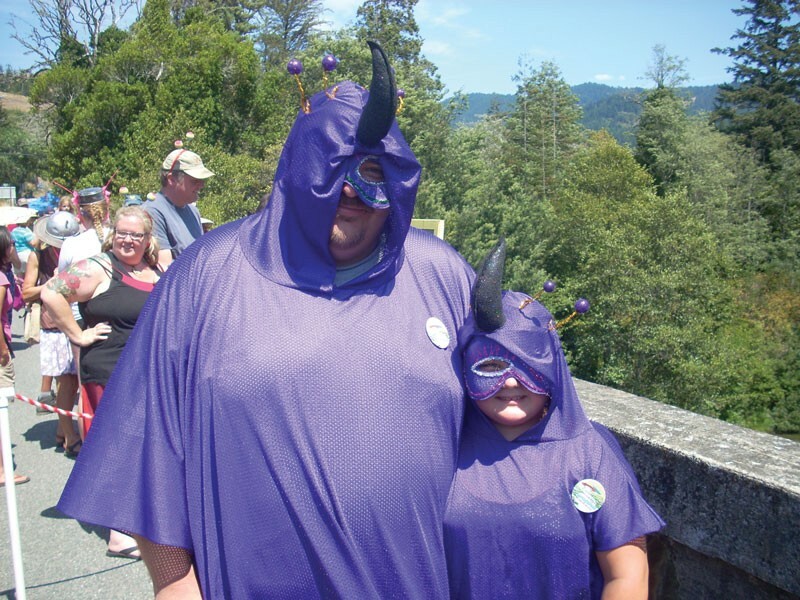 Like dress up as Flying Purple People Eaters and sling saucers off the town bridge. The festival features the universally renowned Intergalactic Flying Saucer Trials, a Dirt Bag Muster and the My Favorite Alien costume contest where "replica specialists" make replicas of people (don't worry, it's nothing like The Fly — we don't think). Earthlings and Others can peruse the arts and crafts fair on the old historic bridge. Diminutive humanoids can stay out of everyone's antennae in the Kids' Zone, and all beings can get their interplanetary groove on to the stellar tunes of Knights of the Van Duzen, Melange, Jenni & David and the Sweet Soul Band, The Hunz at Golden Gate and Stillwater. If Soylent Green isn't your cup of tea, you can snack on burgers, hotdogs, chicken, corn on the cob, blueberry pie and other treats courtesy of the Bridgeville Volunteer Fire Department. There's something for everyone, but please no dogs. Leave Astro at home (not in the ship — it's August in SoHum). Parking and admission is free. So get out there and swap conspiracy theories with others who want to believe. If you haven't been to this space-themed shindig, do yourself a favor and go. Seriously, what would Mulder do?